If you had two sales teams that spoke only English or German and they wanted to share the same products, there currently is no way of showing the product name field in the sales persons own language without duplicating product records. My suggested solution is to write a plugin to intercept the results returned from the database when queried and insert the correct language into the name field. The example I show below works for Products and Opportunity Products, but it could equally be applied to other entities as well. Optimise for performance by minimising database queries and caching where the same data where possible. Allow translation of the Product Name attribute of the Product Entity. Show the Product Name on the Opportunity Product form in the user's language. Show the Product Name title on the Product form in the user's language. Allow easy translation of products into multiple languages an export/import process. The technique adds an attribute for each name translation on the product form, and then intercepts Retrieve and Retrieve-Multiple pipeline steps in order to substitute the name field for the correct translation. 2) When the product is updated, each translated is packed into the 'name' field via the 'Create' and 'Update' pipeline steps. The name attribute is increased in length to hold 4000 characters to accommodate all the translated names. This is done so that all translations are available when querying the name attribute without going back to the database. Each time the name attribute is retrieved, we can always re-write it to include the language that we need without going back to the database to get the new_name_en or new_name_de field values. Note: A limitation of the primary name field is that it has a maximum length of 4,000 characters. The product name is included in a SQL index and so cannot be more than 450 characters (900 bytes). Due to the nature of this technique, we must be able to fit all our translations into these characters, so if we have 5 languages, then each name cannot be more than 90 characters long – since the default Name length is 100 characters, this doesn't seem that unreasonable – especially if you have less than 5 languages. If you are using this technique on a custom entity attribute, then you can use the full 4000 characters. 3) When the Products are queried (via Lookup dialogs or Advanced Find) the results are changed so that the name field only contains the translation that matches the language of the user. 4) When the Opportunity Product is Retrieved, the name field is re-written to only contains the translation that matches the language of the user. 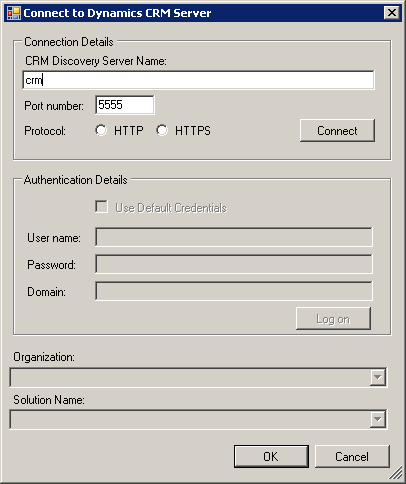 5) The user's selected language is looked up in the UserSetting entity via the UILanguageId attribute. This contains an LCID that is used to match against the correct translated label. 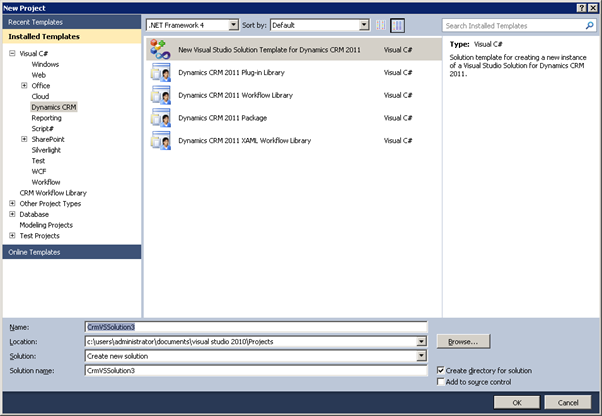 1) Create a Plugin Solution using the CRM Developer Toolkit found in the CRM2011 SDK. 2) Connect to your CRM server and select a solution to add your plugin to. 3) Select the Plugin and Workflow project in turn and open the properties window. Select 'Signing' and check 'Sign the assembly' before selecting '<New…>'. You will be prompted to give your key a name and password. I usually use the name of the project as a name for the key. 4) Open the CRM Explorer window and double click 'Product' to open the Product entity configuration page. 6) We need to create some attributes to hold the translated names of the products. I am only creating English and German, but you can create however many you need. 7) Add the two fields to the Product Form as well, and un-check 'Visible by default' on the 'Name' field. 10) Paste the following code into your class. // Which language is set for the user? IMPORTANT: Change the Name and TypeName to match the namespace of your project. <Plugin Description="Multi Language Support for Products"
Description="Pack the translations into the name field when a Product is Created"
Description="Pack the translations into the name field when a Product is Updated"
Description="Unpack the Product name field when Retrieved"
Description="Unpack the Product name field when Retreived in Lookup/advanced find"
Description=" Unpack the Product name in the Opportunity Product productid lookup when Retreived"
Description="Post-Operation of Product Opportunity Retrieve"
12) Build and deploy your project. You should now be able to create products, providing both a German and English name, and see the correct translations depending on your language selection. You can extend this solution to include quotes, orders, price lists so that the lookups to products on those entities will also show the correct translated name. In the same way that you can export translations from a solution to be translated, you can export the products to excel and mark them as being available for re-import. This file can be passed to a translator, updated and then re-imported. This is a proposed solution to allowing lookup names to be translated into multiple languages. I welcome any feedback/suggestions/alternatives. Download the full solution from the MSDN Code Gallery.